Sounds like a lot of you have been watching the Decorah Eagle Cam. I have had tons of questions about eagles over the past couple weeks. All three eggs are hatched and the eagle parents are doing great jobs feeding their new hatchlings! At first, the oldest hatchlings were beginning to move around a lot more while the youngest was still learning that he/she had a bunch of parts that like to wobble around! By now the coloring of the hatchlings has changed to a muddy grey and the hatchlings are beginning to spread their wings and bat at each other with their beaks. They are really starting to gain control of their movements!! Did you know there is another eagle cam? The EagleValley Eagle cam is also part of the Raptor Resource Project. 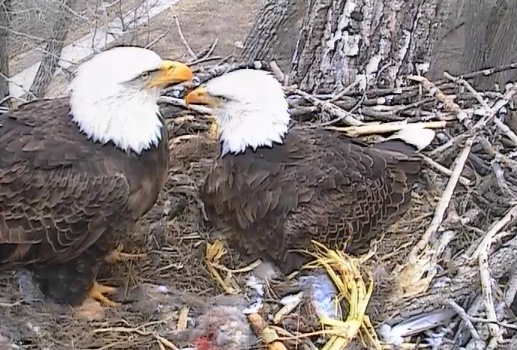 The Eagle Crest eagles have two eggs incubating. The Raptor Resource Project provides viewers with great information and resources. Their mission is to help preserve falcons, eagles, ospreys, hawks, and owls. Check out their website for links to other bird cams and even activities like building a nest box! Well, Chris, below are a few pictures of the different stages that bald eagles go through. As you can see, they start off very small, but they grow fast! Female eagles lay 1-3 eggs and the eggs take about 35 days to incubate. Below are three images, each showing a few of the stages that bald eagles mature through. The first image shows two hatchlings – notice their white fluffy down that quickly changes within the first few weeks to darker grey and brown down as seen in the second image. The third image shows the coloring of eagles that occurs around 12 weeks and this is the color they remain for about 3-5 years. The head, neck, and tail feathers do not turn completely white until around the 4th or 5th year! Eagles reach their full coloring around their 5th year. They can have a wing span up to 8 feet and weigh as much as 15 lbs! The female bald eagle tends to grow a little larger than her male counterparts. You can see this for yourselves as you watch the Decorah Eagle Cam – the male parent has a sleeker, smaller body than the female – the hatchlings no longer fit under him! Well, Jae, eagles can live up to 40 years and even longer in captivity! However, their environment often poses risks for the bald eagles. Causes of death for eagles include from gun shot wounds, electrocution, poisoning, collisions with vehicles, and starvation. You may notice that only one of those causes is a “natural” cause of death. It is important to remember that bald eagles are a protected species and the Bald and Golden Eagle Protection Act (1940) provides criminal penalties for (just to name a few!!) the poaching, transporting, hunting, exporting, poisoning, killing, trapping or capturing of all bald and golden eagles. You can find more information on the Bald and Golden Eagle Protection Act by clicking here and if you suspect poaching of bald eagles contact the Iowa DNR at (800) 532-2020 or click here for Iowa’s Turn-In-Poaching website. Eagles mate for life – once they find their mate, they stay together until one of them dies. If one does die before the other, they will seek out a new mate. Fish is a mainstay for eagles! First of all, eagles eat mainly fish, but will forage for other meats when fish is not available – squirrels, rabbits, other birds, etc. That being said, eagles are at the top of the food chain – they are predators, their bodies designed to hunt and eat meat. Thank you to all of you for your great questions. If you don’t see the answer to your question, check back soon, I will answer three of your questions each week on Kids’ Corner. When your question is featured, your name will be included along with your question. Remember, if you have a question you would like answered click on “Ask SkyWolf” above this post and your question could be featured next week on Kids’ Corner!